On this bright and sunny day with temperatures below freezing, I want to invite you into my home where it is warm and cozy! I want to show you where the Magic happens. My New Studio!! I have just spent the last five days remaking my studio. It is now clean and organized and ready to be used to its fullest!! I have revamped not only the studio but my thinking on how it should look and function, and I have also changed my organizational system. I believe this new way will make things much easier to find, and make the process of creating much more enjoyable! 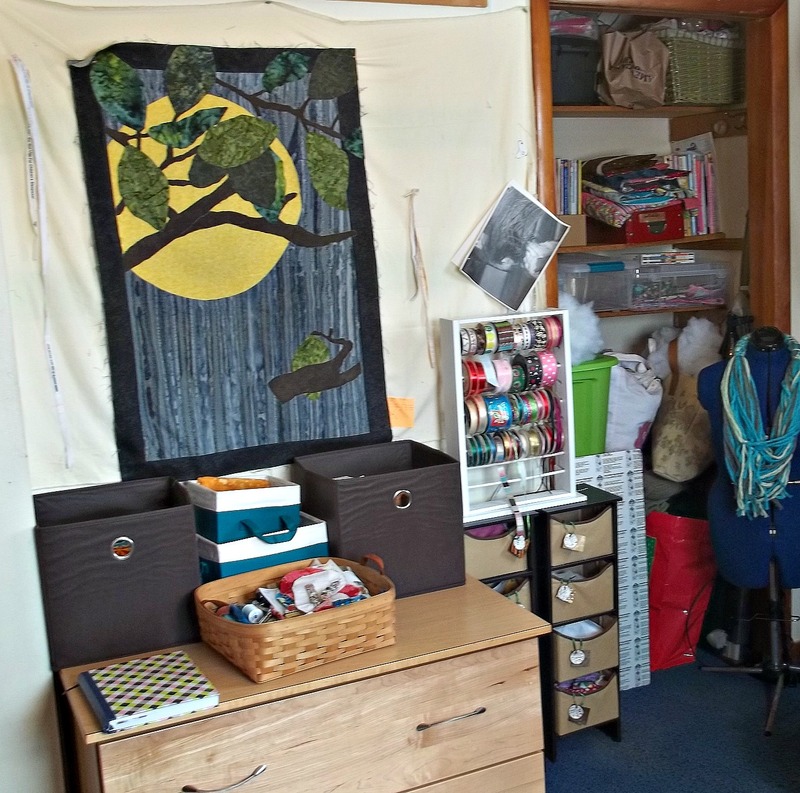 When you first walk into the room and turn left you will see my fabric area, which is now all neat and organized according to fabrics. 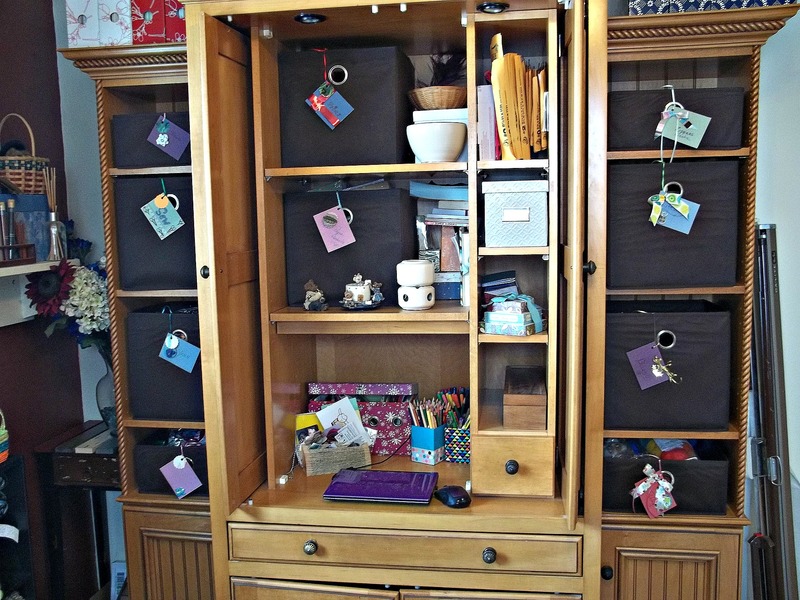 The large drawers and baskets on top hold the larger pieces of fabric while the small units next to the cabinet contain scraps of fabric separated by colors. Look how nice and wonderful all the fabric looks, and now I can know in moments what I have and don’t have!! 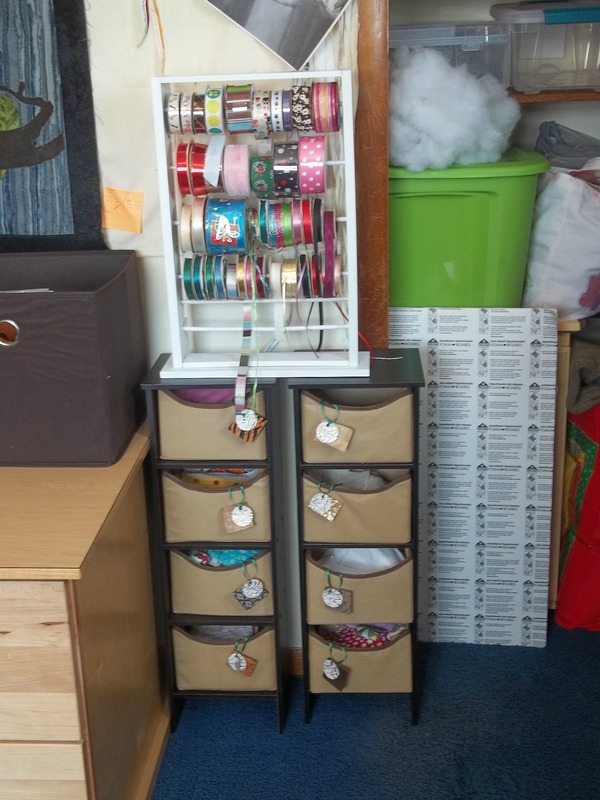 Next is the units that hold the fabric scraps, all labeled, with my ribbon rack on top. 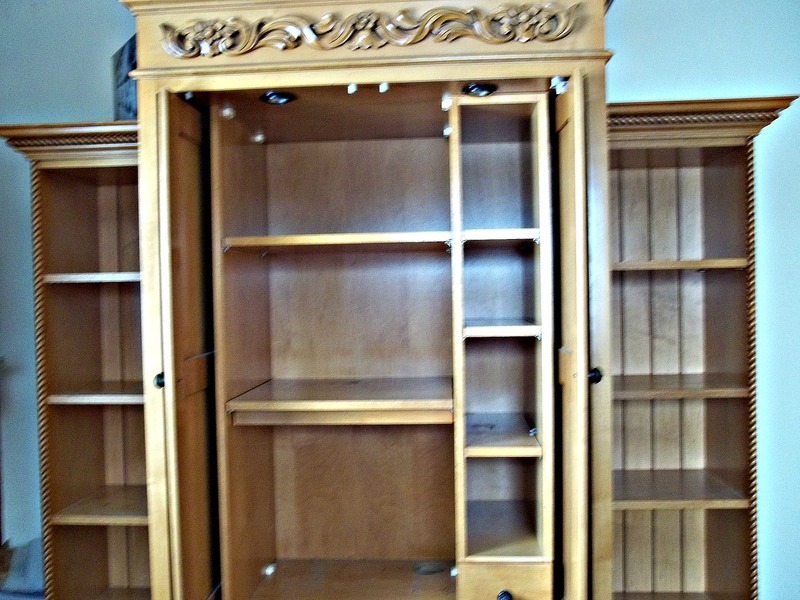 Behind it and to the right is a closet which I am not showcasing because it can only look so good. As you turn the corner you will find my ironing board in its permanent spot. No more lugging it around and trying to find a spot for it!! I am probably most excited about this. My dream would be to have an ironing board that drops down from the wall, but I am unsure if that is possible? I love my ironing board and iron!! And no your eyes are not deceiving you that is a “Hula Hoop” hanging up on the wall. I read somewhere that if you get up and ‘Hula Hoop” for ten minutes every hour you can take inches off your waist! So now I do just that…well not exactly… I am nowhere near ten minutes more like 2 or 3 minutes tops…but I’m working on it! Above the ironing board is a window that looks out to my amazing flower garden with a large shelf below it. I have put on display some of my favorite things. The painting in the back was painted by the talented Cally Traversari, (her Etsy shop is http://www.etsy.com/shop/callyscreationsuk ). I purchased this painting from her and I just love looking at it each and everyday. 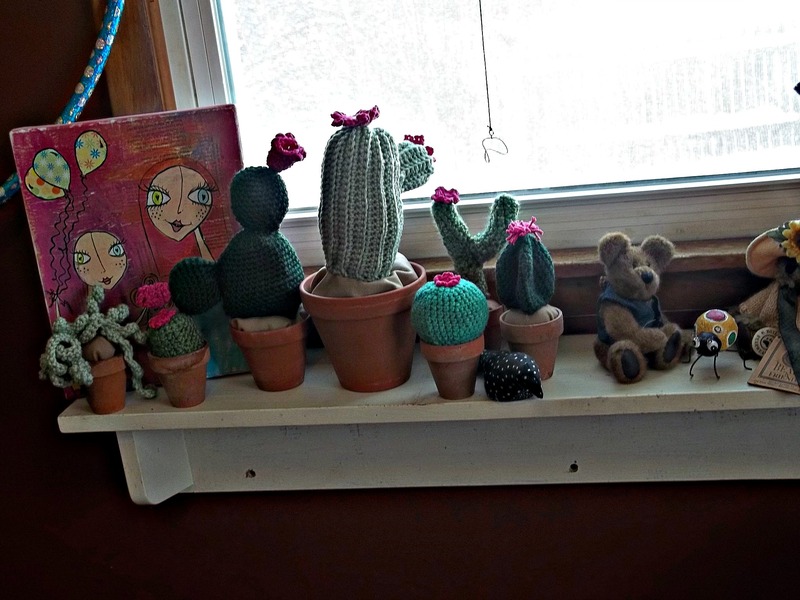 I have also displayed the cactus’ that I have just finished. 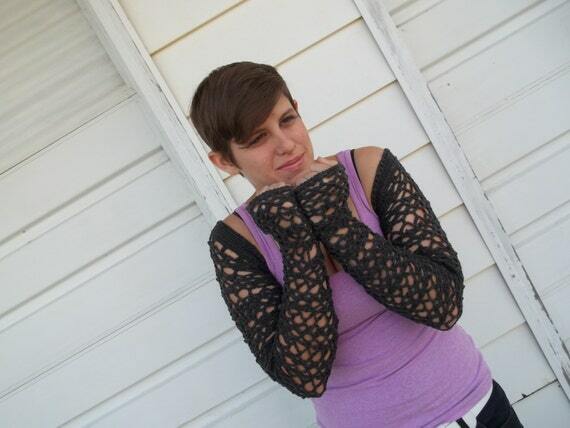 I crocheted them and really enjoy what they bring to my creative area. I think their cute! Snug between the two windows is my real work station. On the back wall are glimpses of my inspiration. 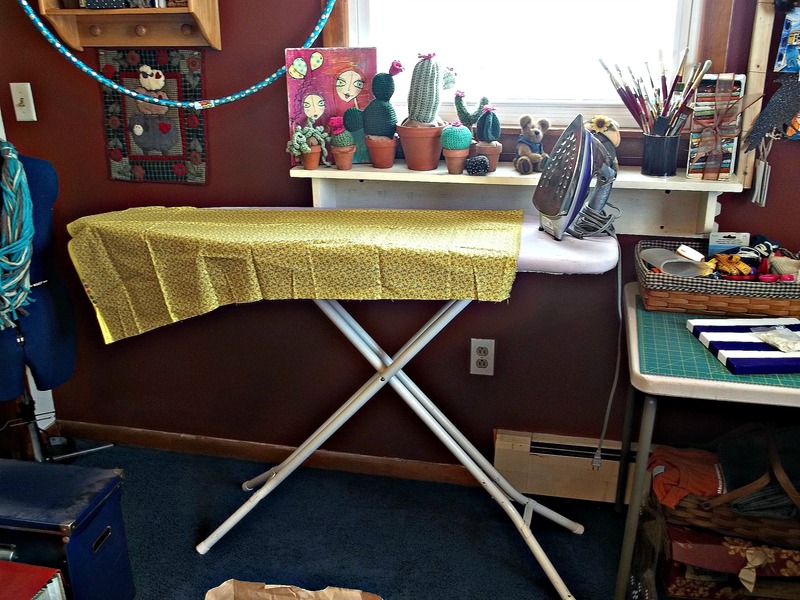 My sewing machine (which I love, like I love my ironing board and iron), and my table for cutting fabric. The american flag in the background is one I designed and made a few years ago(hand quilted and embroidered), and it reminds me often of how fortunate I am to be living in America!! Here it is…all incorprated into my studio. 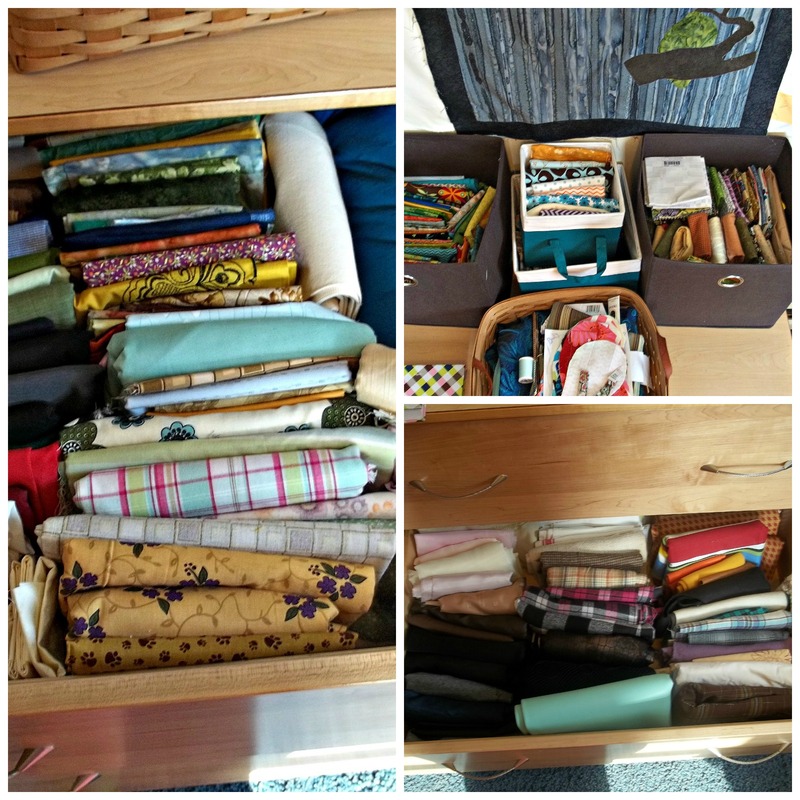 I purchased cloth baskets so I could separate all the supplies into different areas. Papers, buttons, yarn, hand sewing supplies, trim, ribbons and such. Each one is labeled, so anyone(my sons) can find what they need. I now have a small section which holds a selection of shipping envelopes, so I don’t have to dig into a large box looking for the size I need. The desk area is set up so I can write notes of “Thanks” to my customers and to work on the computer!! I love it!! So that is the end of the tour, what do you think of my studio? Do you have any ideas for me to improve on my studio? 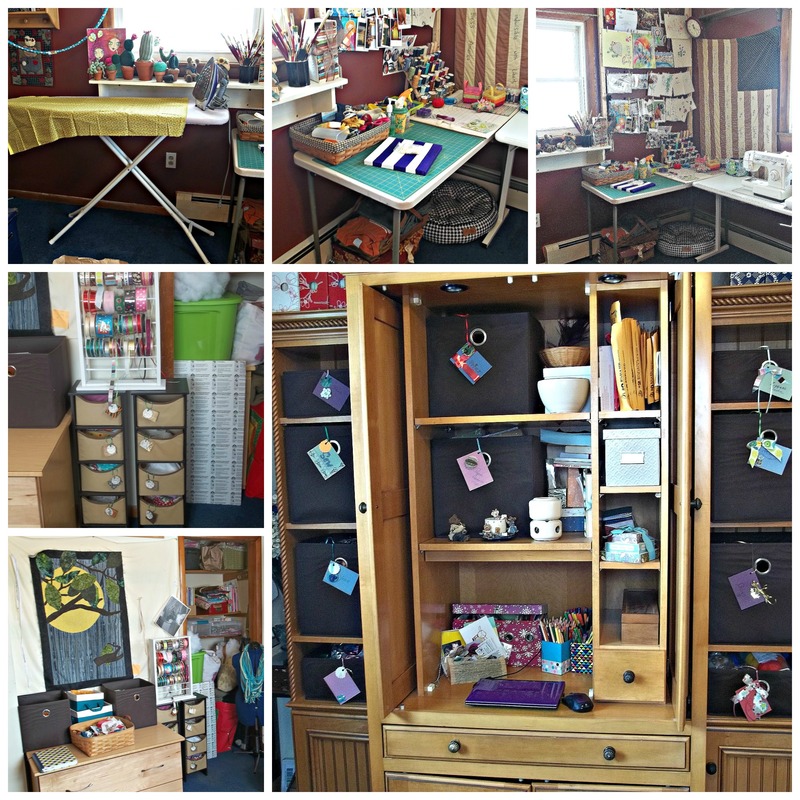 Is your studio organized and being used to its full potential? 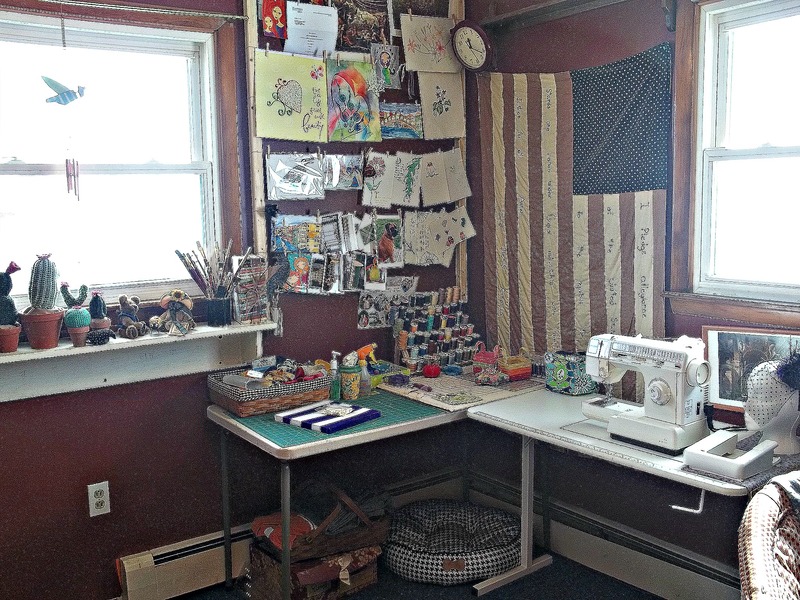 If it isn’t I hope my studio can inspire you to revamp yours and make it all it can be!! Hope you enjoyed your tour of “Black Raven Creations Studio”! This entry was posted in Black Raven Creations, Etsy and tagged Art studio, blackravencreations, craft room, organization, sewing center. Bookmark the permalink. 4 Responses to The Magic Within…. Great way to utilize the room to the fullest! Liked the blog as well! Thank you so much!! I am loving my room, everything is so much easier and I have a large area of empty space now. Glad you liked my blog I had a good time writing it!! 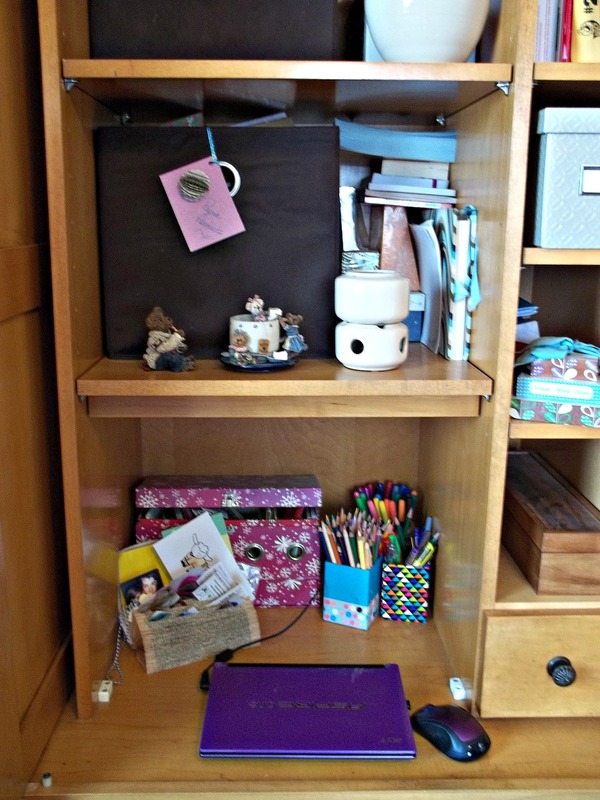 No it isn’t, I told my son I wanted a way to display my favorite things that inspire me, so he took some wood (I think 2×2) and then wrapped wire around them and hung against the wall….it works great and we had everything here so it was free….